Wingman Foundation 5K & 1 Mile – April 13, 2019 | NC Race Timing and Running Events | Go Time! The inaugural Wingman Foundation Coastal Carolina Memorial 5K & Kids 1 Mile is the first event in the Carolinas hosted by The Wingman Foundation to raise awareness of our mission to support Gold Star Families that have lost loved ones in Navy and Marine Aviation mishaps. This year we will remember SSgt T.J. Dudley who was lost during combat operations in Helmand Province Afghanistan on July 7, 2011. We are honored to have his widow, Mary Dudley, and other family members here to remember TJ and to raise awareness for The Wingman Foundation through this 5K and Kids 1 Mile. The Wingman Foundation is an all-volunteer, veteran-founded non-profit organization dedicated to providing immediate post-mishap support for the Navy and Marine Corps Aviation community and their families. In addition to providing immediate support, the foundation is also proud to ensure that our nation’s fallen heroes are never forgotten and the loved ones they leave behind are always supported. The foundation is able to honor our fallen heroes and provide for those they leave behind through your generous donations, volunteering, and business relationships. Award Winners will receive a medal & small basket from Mission BBQ! Mission BBQ will also open early (10AM) after the race for participants! Race Shirts are still available with limited sizing options. The shirts are available in Youth S-M and Adult Unisex XS-XXL cut sizes, and are made of a cotton/polyester blend. MEDALS: The first 200 registrants will receive a Medal! 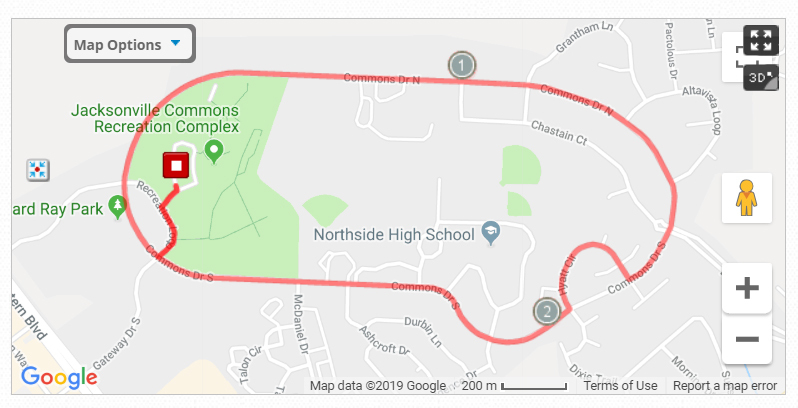 This course is a mostly flat, one loop route through the Jacksonville Commons neighborhood. The total elevation change is 45 feet throughout the course and will be mainly on a concrete path with a couple small sections on the road. Parking is available in several parking lots near the Jacksonville Commons Recreation Center. Please park in marked spots only. Registration for this race is FREE for everyone! The purpose of this race is to raise awareness, instead of fundraise. However, you MUST still register to be able to participate in this event.